I believe I added just enough blog posts this year that there are not two years’ Halloween posts on the front page at the same time. That would be sad. Alex told me in September that October was his favorite month of the year, “because Halloween.” And every day for the last few weeks, he would ask, “is it Halloween today?” I can only hope that this year’s candy crawl met his expectations. He went as Captain America, a decision that was entirely his own. Ian went as a penguin, or at least he wore parts of his penguin costume throughout the night, rarely all at once. 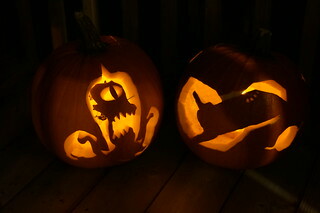 For jack-o-lanterns we went with a space theme this year: a space shuttle on one and Kodos on the other. I tried etching rather than carving but I couldn’t get the technique down, so I wound up carving for the most part. One fun addition, albeit short-lived, was the use of sparklers instead of LED candles as lighting. Next year we’ll use rocket engines. It is a bit late for a Halloween post, but insert lame excuse here. Consider it a counter-balance to the force that causes Christmas decorations to show up in stores in September. 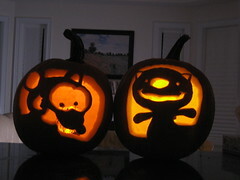 Inside these gourds I used little battery-powered LED lights made for the purpose instead of actual candles. While LED lights don’t look nearly as nice as real candles, one need not care so much about potentially setting things on fire. On the evening of the 31st, as a few groups of kids had already arrived and absconded with their hard-earned treats, I found myself with a third pumpkin untouched by blade, but no light (or candle) to go in it, should I decide to carve it. 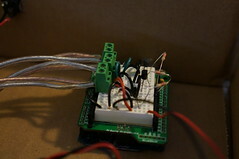 Then, I remembered my extra spools of SMT LEDs from the cabinet lighting project. 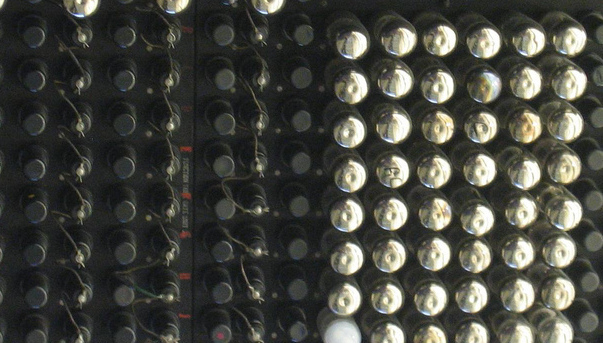 I calculated that a 9 volt battery could power three such LEDs for about 10 hours (that estimate was conservative by a factor of 3, it turned out — I need to go back to EE school). 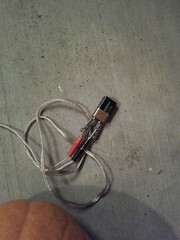 Thanks to various other projects, I already had some speaker wire with alligator clips on each end, so, in the course of 5 minutes, I threw together a functional pumpkin light, carved a few holes in the pumpkin, and called it a day. No need to clean out the guts when open flames are not a factor. For his first Halloween, Ian went as a dragon. 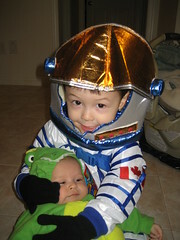 Typical of his recent enthusiasm for all things space-related, Alex went as an astronaut. 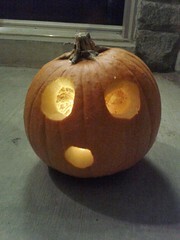 Instead of saying “trick-or-treat,” he would announce, “Hi, I’m Alex. I’m an astronaut!” Much candy was received, all the same. I made two Jack-o-lanterns this year. 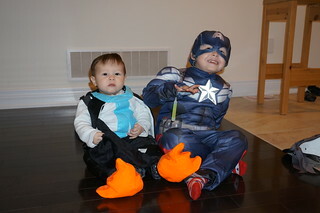 On the left we have Elmo and Cookie Monster, a nod to our 16-month-old’s second Halloween. 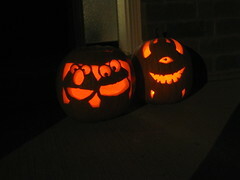 On the right, my best attempt at a cacodemon from the old video game Doom. My general technique is to sketch up the design in Inkscape, print it out, transfer the design to the pumpkin somehow, then go to work with one of those little pumpkin carving saws. The cacodemon was a bit simpler so I skipped Inkscape and free-handed it with a sharpie. 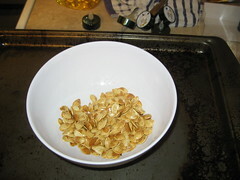 We tried toasting the pumpkin seeds. While edible, I found the eating experience akin to that of eating un-popped popcorn kernels. I’ll probably give this experiment a miss next year. In Canada, giving out chips is almost as popular as giving out candy. 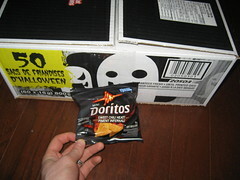 As new Canadians, we are following suit: visitors to our house will get tiny bags of Doritos. I guess that means no Coffee Crisps, Aero bars, or Smarties for me (these locally available confections have yet to cross the Lake). I also had grandiose plans to make Alex a costume, but faith in my fabric sewing skills waned a bit as the deadline approached. 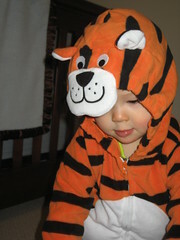 Angeline saved the day by picking up a costume at the local Carter’s, so he’ll be a tiger this year. Fear.